Experience on course conditions at the Brookwater Golf Course Driving Range which offers 12 Public and 10 Member grass hitting bays, chipping and bunker areas and a large putting green, perfect for improving both your long and short game. The Brookwater Golf Driving Range is open 7 days a week and is the perfect place to practise your golf. 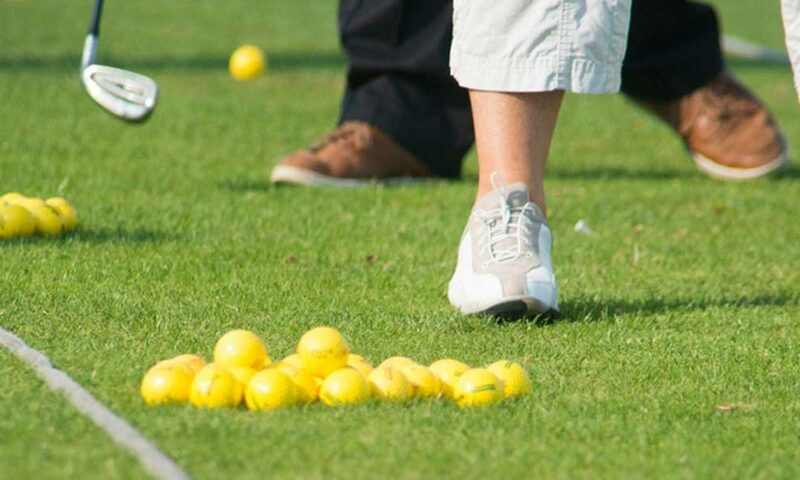 Practise your golf swing at the Brookwater Driving Range one ball at a time. The Brookwater Driving Range also has golf equipment for hire available from the Golf Shop. Purchasing a Brookwater Golf Course Range Pass offers excellent value and the opportunity to practice your game with on course conditions, on our all grass hitting bays and putting and chipping greens. Range Passes can be purchased at the golf shop or by phone at 3814 5500. Talk to the Brookwater Golf Course Driving Range today for any enquiries or to make a booking! The Brookwater Driving Range is open 7 days a week – see below for our open hours. *Golfers please note that Last Balls are to be given out 30 minutes prior to closure. If you’re looking to get on course, then the Brookwater Golf Course Driving Range is perfect location near you! Sometimes some words from a pro can go a long way – if you’re looking to improve your swing even more, the Brookwater Golf Course also offers golf lessons and coaching for young and old from our seasoned pros John Collins and Ian Triggs. Book your Golf Lesson today!